July 2, 2018 — Former Kansas City, Mo., Mayor Kay Barnes, who has been serving Park University as its senior academic ambassador and liaison, has been appointed as the University’s senior director for university engagement. Barnes began her new role within the University’s Office of University Engagement on July 1. As the senior director for university engagement, Barnes will represent the University as an ambassador in its government relations and business development initiatives. In addition, she will deliver public presentations and connect colleagues across the University with external stakeholders. Barnes began her career at Park in 2007 as the founding director of the University’s Center for Leadership and as a distinguished professor for public leadership within the Hauptmann School of Public Affairs. 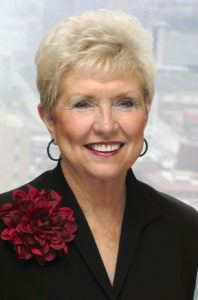 Previously, Barnes served as the first female mayor in the history of Kansas City, Mo., from 1999 to 2007. She was founder and president of Kay Waldo Inc., a human resource development firm specializing in communications, leadership development, management/supervision, team building and time/stress management from 1976 to 1998. Barnes served as a member of the KCMO City Council representing the 4th District from 1979 to 1983, and she was a member of the Jackson County, Mo., Legislature from 1974 to 1978 as its 4th District representative. Barnes earned a Master of Public Administration degree in organizational behavior and a Master of Arts degree in secondary education from the University of Missouri-Kansas City, and a Bachelor of Science degree in secondary education from the University of Kansas. She also received an honorary doctorate from Park University in 2006. In mid-June, Barnes was recognized by UMKC’s Alumni Association as its Alumna of the Year. She was honored for her service as KCMO mayor and for her leadership in helping revitalize Kansas City’s downtown area, as well as being a tireless champion for women. Former Kansas City, Mo., Mayor Kay Barnes, who has been serving Park University as its senior academic ambassador and liaison, has been appointed as the University’s senior director for university engagement. Barnes began her new role within the University’s Office of University Engagement on July 1.